Christians have been exchanging that greeting for centuries upon centuries. It’s the Easter story in one line. It’s why we are here today. And Christians of all backgrounds today, Greek Orthodox to Presbyterian, Roman Catholic to Lutheran, are repeating it in church, and to one another. I’m not sure if they said it on that first Easter or not, but I’m sure they said something like it. It was Sunday morning, and the sabbath was over. It was the first chance that Mary Magdalene and Mary were able to go to visit Christ’s tomb. Scripture tells us that there was an earthquake, and the women looked up to see an angel sitting on the stone that had been rolled away from the tomb. The angel tells them, “don’t be afraid”. Which, when you think about it, is probably what they needed to hear most right then. Because it had been a painful few days, filled with fear. They and lost the one they loved, the one who had given them so much hope and meaning. And here they were, at his tomb, and they couldn’t even find him. So they hear, “don’t be afraid…he isn’t here.” And at first they must have felt like this whole journey had taken one more bad turn. The angel tells them to look inside the tomb. Look around. Jesus has been raised. He’s going to Galilee. Go! See him there. Scripture tells us that the women ran from that place. They ran with both “fear and great joy”. They ran to tell the others. And it was only when they had started running, that Christ met them on the road. Again, he tells them “don’t be afraid”. Go, and spread the word. And I’ll bet that like Mary and Mary Magdalene they did a lot of running too. Running to tell each other. Running to find Jesus. Running to go and see the empty tomb for themselves. And through it all they ran with both the “fear and great joy” that Scripture tells us about. Because they just heard the best news in the world, and I’ll bet at some level it terrified them. What if it wasn’t true? And, even scarier, what if it was? What now? Sometimes in the church we tend to treat Easter as a finish line. It’s the end of Lent, when we can finally give up whatever Lenten spiritual practices we had. And I’m sure today lots of people will be returning to red meat or candy or coffee. It’s also the end of Holy Week, when churches everywhere have multiple mid-week services. And it even coincides with the end of a long and cold winter, when it looked like spring would never come. Today with the sanctuary filled with beautiful flowers, with the weather warming up, with the sun out, with the long days of Lent over, it feels like new life is all around us. It feels like we have made it. And it is. And we have. But it would be a mistake to think of Easter as the finish line. 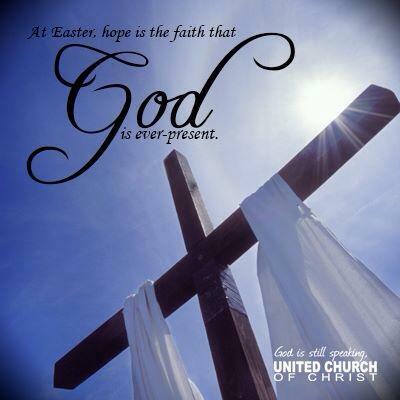 Because as much as Good Friday was an end in some ways, Easter is just the beginning. And as much as we went deeper in Lent, it wasn’t just a seasonal thing. It was preparation for today and what comes next. Today is the day where we start running. I’ll admit, I’ve always had a complicated relationship with running. I’ve never been very good at it, or very fast. But I’ve always admired people who run, particularly the ones who can run long distances. I can’t imagine running a marathon, and I can’t imagine covering 26.2 miles, but if someone chooses to do that, more power to them. It takes discipline and strength and endurance. It takes a commitment that is worthy of recognition. This past week I went with Heidi to her home church for the one year anniversary service for the Boston Marathon bombing. Old South in Boston sits just feet away from the finish line of the Marathon, where the bombs went off a year ago. And at Old South it has been a year of recovery and a year of finding hope. And she’s right. The Christian life isn’t a sprint. It’s not something done quickly by going to church every Sunday morning, or even by observing Lent for forty days. Instead, the Christian life is a long journey, full of challenge, full of opportunities to quit. There are times when you wonder “is this worth it”? There are times when you can’t remember why you signed up in the first place. And there are times when you doubt you can go on. But there are also the times when you decide that as hard as it is, you will keep going. And somewhere out there on the course, filled with fear, but anticipating joy, you find Christ. That day as Mary and Mary Magdalene ran, they knew something new had happened. That’s why they weren’t feeling just joy or fear, they were feeling both. And if you are here today, on Easter morning, standing at the starting line of another year, if you are serious about this whole Christian faith thing, you will likely feel the same. The joy of Easter morning, and just a little apprehension about what this means. Because that Resurrection that happened two thousand years ago didn’t just change things for the disciples that day. It changed things for us. And every year we get this reminder of what happened, and what it means. And every year we choose to stand on this starting line once again, and to run. Monday in Boston they are going to run the marathon again. When you think about it, that’s a show of hope. And if I was going to be running, I think that this year in particular I would be feeling both fear and joy in some intense ways. The city has, of course, done a lot to commemorate this event, and to prepare for this run. But there’s one thing that happened that has touched me more than all the others. And the idea came out of Old South, that same church that was so touched by all of this a year ago. A few months ago Old South asked people who knit to knit scarves for the runners who would be coming to Boston. They wanted them in blue and yellow, the colors of the marathon. And they thought if they were lucky they’d get a few hundred, just enough that they could give one to all the marathoners who come to their annual Blessing of the Athletes service. And so around Boston, and across the country, and even in other countries, knitters went to work. And you should never underestimate knitting circles, it seems, because when all was said and done over 7,000 scarves arrived. The post office had to start making special deliveries in the final days. And this weekend, as the city prepares again for the Marathon, parishioners are going out into the streets, and they are finding athletes, and offering them a scarf and saying “let us wrap you in courage and strength”. At first many of the runners asked how much they had to pay for them, and then when they were told that they were free and that they had been knitted to give them ever support, they broke down in tears. They knew that someone had taken the time to send love and comfort and courage to them, and it blew them away. That’s church, y’all. That’s a church finding a way to visibly show a city that Christ’s love is breaking into a place that had been so filled with pain and senseless violence. That’s a church standing, literally, at a finish line the had been torn apart and saying “what now”. And that’s finding your way back to the starting line and deciding to run again. That’s resurrection. Resurrection happens all the time. We only have to have eyes to see it. But first, we need a willingness to run the race. Today we are standing at the starting line again. We are preparing to run this race of witnessing to the resurrection for another year. We are going to have times when we run with ease. Times when the course gets tougher. And times when we have to lean on one another to make it up the hill. But, together, come fear or come joy or come both, we can get there.